The wait is finally over! 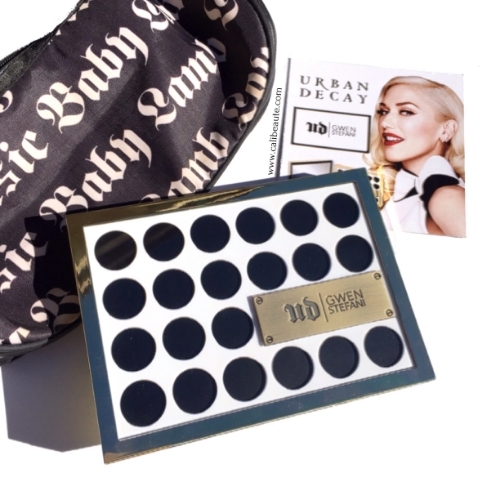 The Urban Decay X Gwen Stefani eyeshadow palette is finally available for purchase online and will be available in stores. I have been a long time fan of Gwen Stefani. Not only have I countlessly played her songs numerous times on my playlist, but I’ve admired her sense of style. She truly is the epitome of style, with her fashion forward looks and camera ready makeup. I have purchased many “All things Gwen” over the years, from her fragrance releases, and in particular her varied assortment of L.A.M.B. bags. (pictured above) Upon seeing images of her collaboration with edgy beauty brand, Urban Decay, I knew I had to have it! 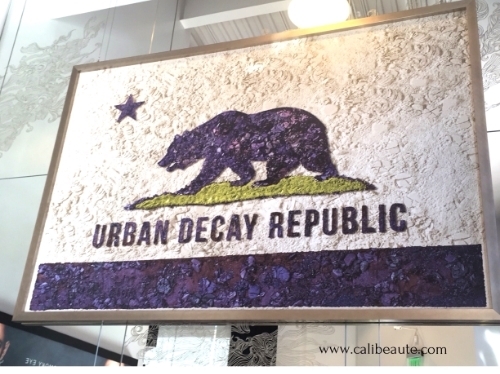 I visited the Urban Decay Flagship store in Newport Beach, CA upon its release. 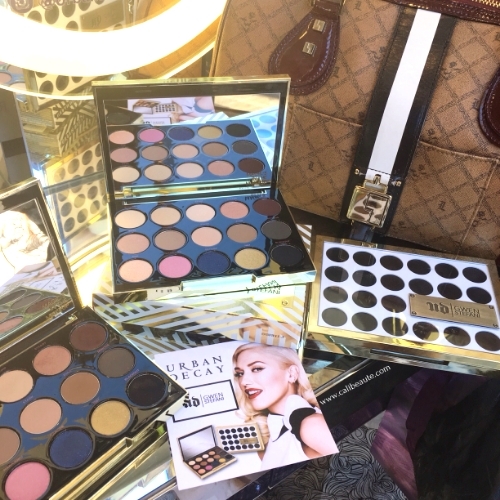 The store had an event for its exclusive release along with sweet treats and a free In Style magazine featuring Gwen on the cover with the palette’s purchase.There was also a possibility to receive an exclusively signed palette by Gwen herself, though I did not receive one. I also met up with my fellow blogger friend Susie, from at BlushedandBronzed and we were there for the same purpose, to pick up the newly released Gwen palette. Once inside the store, I quickly purchased it. Alas, it is mine! Today I wanted to share some detailed images of the palette along with swatches and my first impressions. 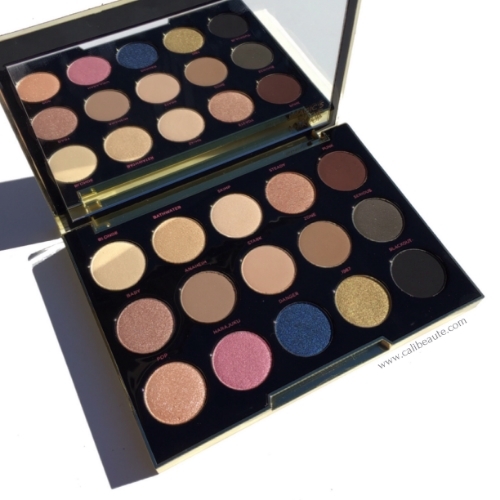 The palette features gold hardware with black and white packaging. The black and white circular graphic hides the 15 shadows within the palette. An UD|GWEN emblem is emblazoned in the front of the palette in gold tone hardware. The design was inspired by Gwen’s love of graphic prints. 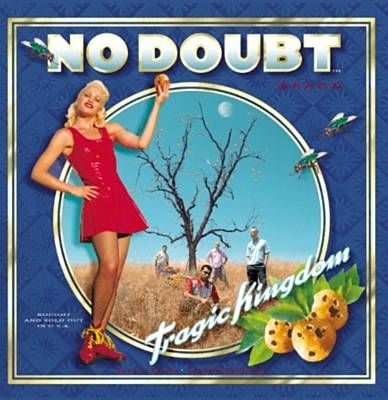 A sizable mirror is included and a reference to the No Doubt song, “Magic’s in the Makeup” is emblazoned on the lower right hand corner of the mirror. This is the beauty collaboration you’ve been waiting for! 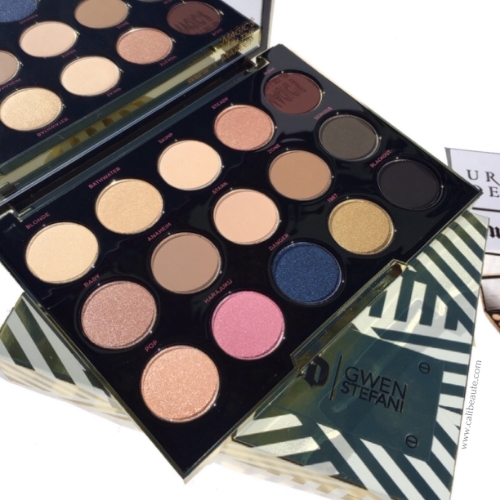 We partnered with Gwen to create her ultimate eyeshadow collection. From her 15 can’t-live-without shades to the super-luxe case, Gwen designed and developed her perfect palette. We spent countless hours at Gwen’s house, talking makeup and working closely with her on every detail. We carefully crafted the shadows with Gwen filling a void by creating the exact shades she always wished she had in her collection. We loaded this palette with her 15 must-have shades of Eyeshadow (12 are NEW, and three are from the UD shadow collection). 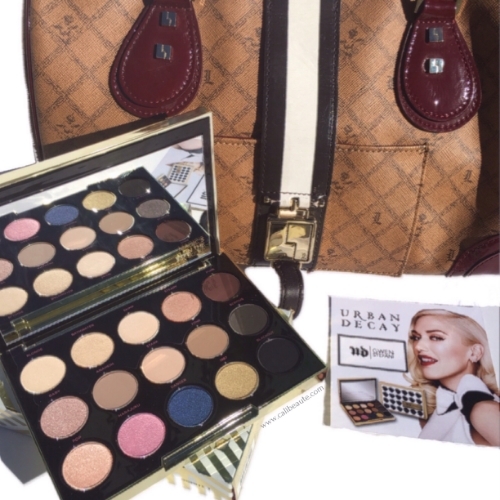 With an insane range of neutrals and a few jewel tones to mix things up, this is Gwen’s go-to kit to achieve her most iconic looks. And with these shades in your arsenal, you’ll have everything you need to recreate these signature looks for yourself. 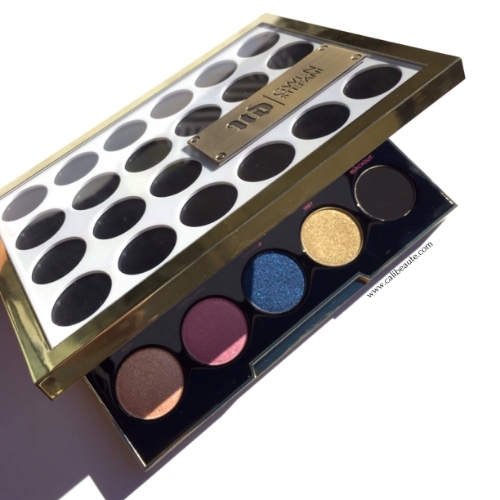 12 of the colors are completely new to the brand, while three are from the existing Urban Decay eyeshadow collection. “I wanted it to be things I really use,” Stefani says of the mostly neutral shades. Skimp, Stark and Blackout are familiar shades, while all the others are aptly named by Gwen herself. 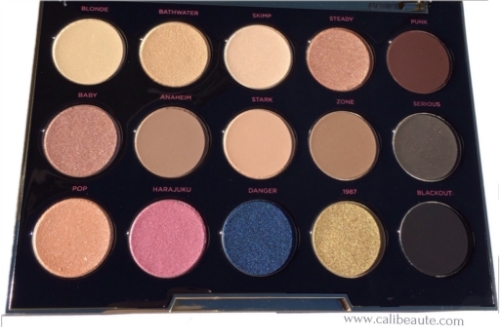 There are really no stand out shades in this palette. It features a few bold and vibrant colors to play with. However, these are precisely my kind of colors. I am all about neutrals, so this works for me because it could easily be my everyday go-to shades. Keep in mind that these are shades that Gwen frequently uses herself, and it is a representation of what’s in her makeup arsenal. If you like colors in the bold, vibrant variety, this may not be for you. As for me, it is right up my makeup alley. The shadows are on par with the quality of UD eyeshadows, extremely creamy, pigmented, and velvety thanks to the proprietary blend of ingredients in their pigment infusion system. The only shade that I experienced a little fall out with when swatching was Pop, perhaps because it contains some glitter particles. Other than that, all the other colors I’ve used used so far applied quite nicely and lasted through out the day, paired with the use of their ever popular eye primer. I also LOVE the packaging. It is hands down, my favorite of all the limited edition packaging Urban Decay has released to this date. 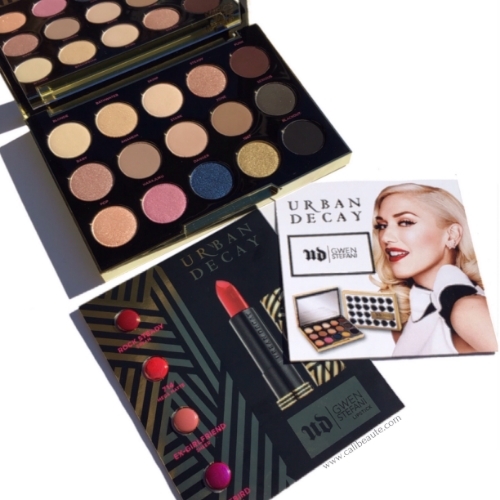 This palette meets my expectations in so many ways and I am glad to add another Gwen inspired product to my makeup collection.The palette retails for $58 and is available online and at major beauty retailers. I wanted to leave you with some fun images & facts that are Gwen related. *Gwen and I share the same Alma Mater, Cal State University Fullerton. Go Titans! 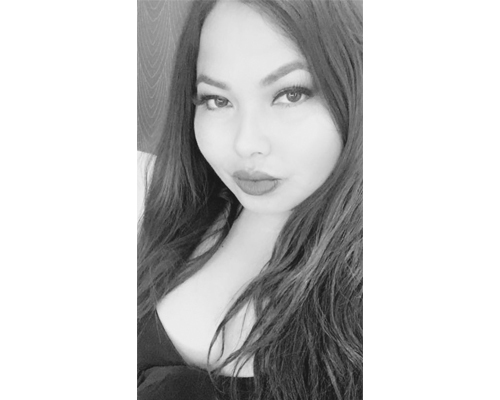 *I have 6 of her L.A.M.B designed handbags/ accessories that I won’t dare part with because of the nostalgic memories it brings. Rocking Gwen’s Mandeville L.A.M.B bag with my bestie circa 2008. New Years Eve 2009 -accesorized with my LAMB Clutch on the far left. With my beautiful sister, who’s also an avid Gwen Stefani fan. Thank you for stopping by today. I hope you found the images and swatches helpful.